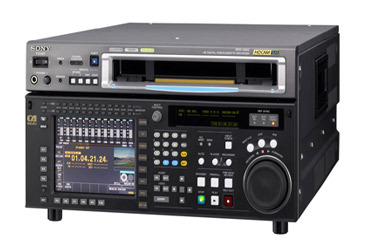 The Sony SRW-5800/1 is a full-bandwidth HDCAM SR studio recorder featuring a 3G-SDI interface. The 3G-SDI connection provides users with the ability to transfer 4:2:2 1080/60p or 4:4:4 1080/24p through one SDI connection. The deck is used in conjunction with Sony's top-quality CineAlta line of cameras, to deliver the pinnacle in High Definition acquisition. The HDCAM format has been widely accepted by top professionals as the HD format of choice due to Sony's commitment to providing the highest quality solutions for the most demanding cinematographers. The SRW-5800/1 is capable of ingesting both standard HDCAM and HDCAM SR formats while still providing a wide range of other uses, such as video/audio archiving and mastering for HDCAM SR. This coupled with features such as integrated up-conversion, down-conversion, 2:3 pull down, and legacy playback of HDCAM or Digital BETA, makes this VTR the ultimate solution for top-end HD mastering studios and film productions. 3G-SDI: Using the 3G-SDI connection, the SRW-5800/1 is capable of recording full-bandwidth uncompressed 24-bit video for high-end archiving and film production needs. All of which is done over 1 SDI cable instead of the traditional Dual-Link setup. Uncompressed Audio: The SRW-5800/1 is capable of recording uncompressed audio, which makes it a vital tool for high-end audio archiving while being able to record non-audio data such as metadata information. Legacy Playback: The SRW-5800/1 can play both Digital BETA and HDCAM for maximum versatility over the range of Sony professional digital formats. Frame Accurate Editing: Editing with digital cassette allows for frame accurate recording without the hassle of prerolling. MPEG-4 Studio Profile with visually lossless compression. Records 12 channels of uncompressed audio at 24-bit sampling. Records non audio AES/EBU data in audio tracks. Multiple frame rates.